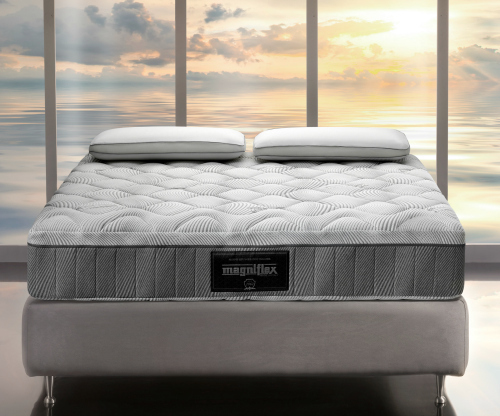 MIAMI, Florida – Magniflex, the Italian high-end compressed mattress specialist, is set to launch Nuvola at the upcoming fall edition of the High Point Market. First seen earlier this year in Las Vegas, the collection incorporates several of the company’s latest technologies. In a statement, the company said the Nuvola collection contains its Thermic fabric and Aquabreeze foam while incorporating its Dual Core technology – which allows couples to adjust their comfort with a quick zip and flip of the internal foam cores. No more compromising in terms of comfort. “The Nuvola collection maintains a contemporary and modern look, in-line with unique technology that is sure to satisfy even the most sophisticated customer,” Richard Landriault, Magniflex director of sales for Canada said in a statement. Each mattress in the collection is covered with the company’s Thermic material, which absorbs body heat generated while sleeping, stores the energy and then releases it to create an incredible sensation of coolness when in contact with the body. “This cutting-edge material is applied to our natural viscose fabric on the top side of the mattress cover, a highly breathable fabric that guarantees freshness and a constant airflow,” he added. Aquabreeze is a plush yet resilient foam that offers a high elastic recovery and increased flexibility. The internal structure of the foam features an open-cell construction, which increases airflow within the mattress for enhanced freshness and coolness. Nuvola will be offered in both a 10-inch and 12-inch program at a opening retail price point of US$1,999 for a queen size. During the High Point Market – which opens for its usual five-day run on 13 October – Magniflex can be found in Space 330 of 220 Elm.